"All of that driving in the early years convinced me that flying was the only way to go." 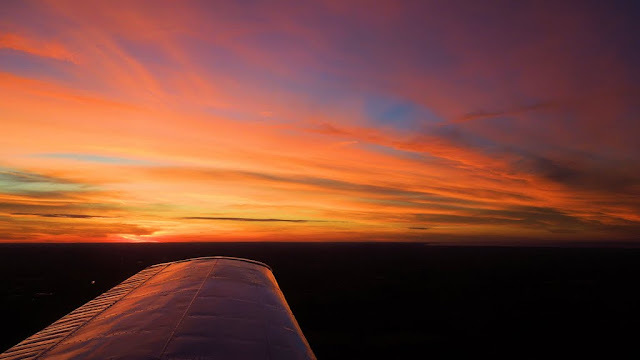 Over the last several years, we have undertaken brief, end of summer flying trips with destinations including the Sleeping Bear Dunes National Lakeshore, the Outer Banks and the Wright National Memorial, the American castles of the Thousand Islands, and the Henry Ford. This year, I proposed a return to Luray Caverns in Virginia, which we last visited when The Bear was three years old. Her memories of that experience have so faded over time that she has no recollection of ever having been there. After three cancellations in 2016, The Bear and I finally found ourselves in the air bound for Luray on September 25. As a young aviatrix, The Bear has gone through many phases of interest in flying. When she was an infant, her understanding of aviation was purely impressionistic. The airplane meant warmth, a gentle vibrating hum, and a mechanical cacophony muted to soothing white noise by her Peltor Jr hearing protectors. With age came awareness of being in the sky, of riding a magic carpet to places farther flung than conveniently reachable by car, of taking delight in bending a flying machine to her will, and of aerial photography. Over the last two years, however, The Bear has shown zero interest in taking the controls or accompanying me on a pleasure cruise. Instead, she has embraced general aviation as a means to an end, for vacation travel and transportation to pancake breakfasts. Since entering this phase, she has usually opted to sit in the back seat with her nose in a book rather than pressed against the airplane window and insists on being being isolated at the audio panel. Given her current phase of indifference to things aeronautical, I was delighted when The Bear insisted on the right seat during our Daddy-Daughter flight to Virginia. 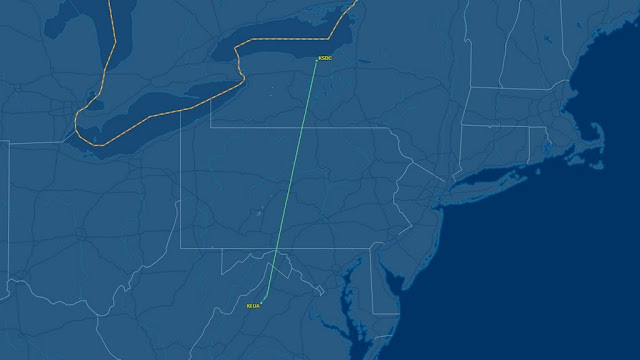 We departed the Williamson-Sodus Airport at 9:00 am and turned southwest toward Latrobe, PA and the Arnold Palmer Regional Airport (KLBE) where we planned to stop for Sunday brunch at DeNunzio's . As usual, areas along the Pennsylvania - New York border showed localized ground fog. 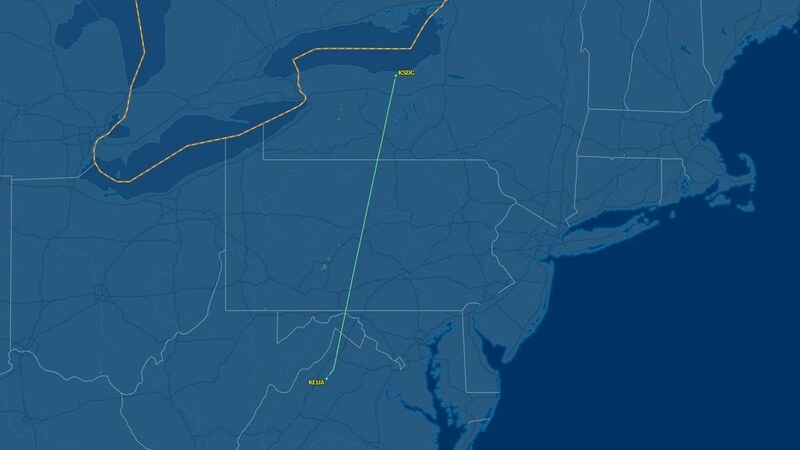 We noticed how the Southern Tier Expressway plunged beneath the cloud cover, an Earthbound equivalent of the instrument approach that we would fly into the Shenandoah Valley later that afternoon. Much of that morning's flight was quiet. The Bear read two novels and part of a third that day whereas I monitored the instruments, occasionally bumped the airplane back onto course, and watched the world go by beyond the Plexiglas. When I saw something particularly intriguing, I pointed it out to her and, likewise, she read interesting passages of her book to me. In that way, it was shared experience. Like all carefully planned journeys, we were well provisioned with snacks. Unfortunately, The Bear's supposedly leak-proof water bottle lost half its contents while sitting in the back seat of the Warrior. Fortunately, it was inside a lunch bag that conveniently contained all of that lost water despite no guarantees of it being leak-proof itself. Sometimes, things just work out. On approach into Latrobe, I noticed a drive-in movie theater. Though drive-ins are unusual enough that they stand out, this particular one caught my attention because it registered as a beehive on first glance; a rare moment when objects on the ground processed as cartoon clip art. This was our first visit to Arnold Palmer Regional (airport #170). Latrobe is located southeast of Pittsburgh and is famously the home turf of golfing legend Arnold Palmer. Palmer grew up near the field, learned to fly there, and became such a tremendous advocate for general aviation that his hometown airport now proudly carries his name. We exited runway 5 on taxiway Delta and held short for taxiing traffic, a Cherokee Six. To our right was a full ramp of turbine aircraft. Directly ahead at Vee Neal Aviation was a number of transient piston aircraft. To the left was the commercial terminal with a Spirit airlines flight boarding from the single available jetbridge. Line service directed us to park on the piston ramp and we were joined by three additional transient aircraft while parked there. Private jets came and went. Though commercial traffic had dwindled over years past, Spirit has been steadily adding flights, boosting passenger traffic fifty-fold in the past five years. All in all, Arnold Palmer Regional seemed to be a robustly healthy airport, particularly for a relatively rural Class Delta field. DeNunzio's occupies the second floor of the back half of the commercial terminal with a great view of the commercial ramp. The A-frame structure with its bank of windows across the back is evocative of an alpine lodge. Crystal chandeliers hang somewhat incongruously from a timber ceiling. As we entered, a cover of Crowded House's "Don't Dream It's Over" was playing, appropriately sung in Italian. The brunch buffet was impressive. For the first course, the Bear stuck to breakfast classics: pancakes, sausage, and fruit, though she did sample the French toast made from Italian bread (it was amazing). The pumpkin waffles were also excellent and, though I wanted to sample a made-to-order omelet, I ran out of room on my plate. Brunch also featured an entire table of entrees, complete with a roast beef carving station at the end. There was also a pasta bar and a table packed with desserts. For our second helping, The Bear wanted pasta with Alfredo sauce. It looked so good that I indulged too, asking the pasta bar chef to saute some shrimp, baby spinach, and mushrooms with mine. The Alfredo sauce was some of the best I've ever had; richly flavorful with a hint of granular texture from the Parmesan. This was no bland, overly-smooth grocery store Alfredo! For dessert, The Bear really wanted a piece of cheesecake. The pasta bar chef was kind enough to investigate the allergy information on the cheesecake sourced from a local bakery. I waited nearly ten minutes as The Bear sat at our table, watching me intently, her expression carefully neutral and tenuously balanced on knife edge, ready to tip either toward dismay or elation. The report from the kitchen and my final verdict made for a very happy Little Bear. Overall, we had a great experience at both DeNunzio's and Arnold Palmer Regional. The airport itself is well-maintained with the overall appearance of healthy flight activity across different segments of aviation. Sadly, the airport's namesake would pass away that very evening, leaving golfers and pilots alike in mourning, another legend gone west in 2016. Line service at Vee Neal Aviation was great, if a little understaffed. After a short wait, we paid for our fuel ($4.99/gal) and returned to the Warrior. I contacted ground control for our instrument clearance to Luray and, though the tower did not have it readily available, it came through during our taxi to the departure end of runway 23. We were cleared on course to the southeast, direct Luray at 7,000'. There is a high ridge immediately east of the airport, but the Warrior was able to outclimb it, though I had my doubts when we first turned on course and the ridge filled the windscreen. The terrain prevented us from reaching Johnstown Approach when Palmer Tower first told us to contact them, but they came through loud and clear once we cleared the ridge and the necessary line of sight for radio communication was restored. 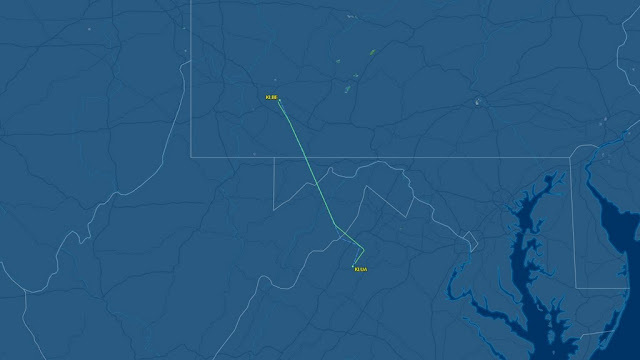 Via ADS-B, I saw that Luray was under a 2,000' overcast. This was consistent with the forecast and I had already planned to fly an approach into the Shenandoah Valley. As we neared our destination, we observed the cloud cover transition from broken to the anticipated solid overcast. From all appearances, the entire Shenandoah Valley was capped by the ceiling. Surface winds were calm at Luray and I requested the RNAV 22 approach from Washington Center. "Warrior 481, proceed direct RECUF (an intermediate fix on the approach) and cross at or above six thousand." Uh-oh. That would put us 1800' higher than the published minimum crossing altitude for RECUF. It would mean a slam-dunk approach in IMC and I dislike those. Just prior to RECUF, we were cleared for the approach. When I reported crossing the fix, Washington Center terminated radar services and we were on our own. We descended through the deck encapsulating the Shenandoah Valley, cognizant of the unseen rock walls that we knew to be rising on either side of us. The procedure was an LP style approach with an advisory electronic glideslope (+V) available; this remained pegged at the bottom of the CDI because Washington Center held us so high at RECUF. I was uncomfortable plummeting through the cloud ceiling like a boulder in free fall and fruitlessly chased the glideslope needle at a modest descent rate. Enshrouded by clouds, a few minutes passed with the world becoming darker and grayer until we finally fell out of the bottom. In the gloomy valley underneath, mountains reached skyward on both sides of us, their tops lost in the ceiling. As I scanned the terrain ahead, I struggled to find the airport. Then I remembered how high and close we were to the field and, when I shifted my focus nearer, I saw it. We were much too high to land and the threshold of runway 22 was about to disappear under the Warrior's nose. With the wind calm, we sidestepped to the right, entered a left downwind pattern leg for runway 4 (we were at the correct altitude for that), and briefly went off frequency to cancel IFR with Washington Center. "Four!" The Bear called as we glided over the massive number painted on the end of the runway. Danny met us at the Warrioir with the airport car while I was still shutting down the airplane. Not wanting to keep him waiting, we quickly secured the cabin, disembarked from the Warrior, locked the door, and jumped into the car. Once at the cavern, I realized that, in my haste to keep Danny from waiting for us, I had left my phone in the airplane. 'Doh! 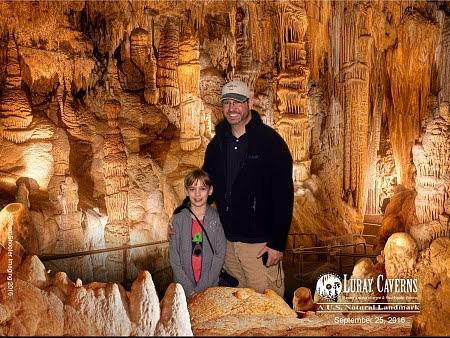 The Luray Caverns Airport is only a mile from the cave and Danny had no qualms about going back for the phone because we would need it to call for a return ride. Still, I was chagrined by the fact that we hustled to avoid wasting his time and, as a result, wasted his time. Hurrying rarely pays-off in science, either (note to management). FlightAware ground track from Latrobe, PA to Luray, VA.
On the way to the cavern (I do not recall if it was the first time or the second time), I commented on how high Washington Center held us at the start of the approach. "Oh, they do that to everybody," Danny assured. Fortunately for us, it was not a fly-the-approach-to-minimums kind of day. It was gloomy in Luray. A nearby carillon rang out its song to shrouded Virginia mountains. Discovered in 1878, Luray Caverns are spectacularly decorated with columns, ornate stalactites and stalagmites, and mirrored pools. A shallow mirror pool known as "Dream Lake" creates a remarkably realistic mirror image of the delicate stalactites covering the ceiling of the cavern. A massive example of flowstone. This alabaster column is known as "Pluto's Ghost" and was evidently quite a spooky apparition when first beheld under flickering torch light. Dissolved copper from pennies gives the water of the "Wishing Well" a greenish cast. The "Fried Egg" formations were created when workmen inadvertently destroyed two stalagmites. I refused to shell out $30 for the official tourist photo because I'm cheap. To put it mildly, The Bear absolutely loved the cave. She took more pictures than I did. Emerging from the cavern after an hour tour, we plunged directly into a labyrinth. The Bear absolutely loved this, too; exploring, running, and, oh, the whimsy! It was a great activity to work out some energy before flying home. We found all four goals within the maze and, upon exiting, called Danny for a ride back to the airport. It was 4:00 in the afternoon. Back at the airport, we encountered a local flight instructor who was looking at the ceiling critically and trying to decide whether he wanted to take a student aloft or not. When I told him that we were bound for Rochester, he casually asked, "filing IFR, then?" I responded that we were. In fact, I already had; all three flight plans for the day were filed from home that morning. At the time, I thought he was just being conversational, but in retrospect, I think he may have been testing my judgment. The trick was deciding how to pick up our clearance. With the clouds still floating at the top of the valley, I suspected that we would not be able to depart VFR and get our clearance before penetrating the ceiling. This meant retrieving our clearance by telephone, which I have done once before. Back at the Warrior, I pulled the iPad out of my flight bag only to discover that I had not turned it off when I stowed it (hurrying will get you every time). ForeFlight inhibits the iPad's built in time-out function and only 18% battery life remained for a 2.5 hour flight home. Fortunately, I had all the data backed up on my phone as well as access to ship power for the iPad. Always leave yourself an out. I reviewed the Obstacle Departure Procedure that specified a more aggressive climb than standard and tracking northeast to the Linden VOR until reaching 5,000'. Ready to call Flight Service for clearance, I scanned the northern sky and caught a hint of blue in the distance that held some promise. We departed runway 4 VFR and proceeded northeast along the valley at 2,500' to investigate. If the gap was insufficient for us to escape, we would return to the airport and call for clearance by phone. This is easy enough to do, but can be time consuming based on local traffic density and the need to manage assigned release and void times. Within a few minutes, we reached a large break in the clouds that was large enough to legally climb through VFR. Back in the realm of color and light, climbing to our filed 7,000' cruise altitude, I contacted Washington Center to pick up our IFR clearance. This was immediately granted: direct Sodus. We left Virginia behind, leapfrogged over small portions of West Virginia and Maryland, and entered Pennsylvania. The Bear went back to her books, a series about cat warriors. The premise sounds sketchy to me, but she absolutely loves them. Our route home took us over Penn State in State College, PA. Penn State was the first graduate school that I visited when I was searching for my next step in life. Though I returned home very excited after the experience, I returned from other places even more excited. Despite the fact that I have been flying over Pennsylvania for over ten years, it was my first time seeing the campus since my visit there in 1994. Random panel pic - just because. North of Lock Haven, we entered what I have always thought of as No Man's Land. This region of Pennsylvania is dominated by thickly forested, steep rolling hills with few roads or any significant sign of civilization. Farther to the northwest, occasional fracking towers interrupt the apparently endless forest, but this particular region is virtually unspoiled. It would be a really bad place to have engine problems. ADS-B showed that we had picked up a tail, another aircraft at the same altitude that was gradually overtaking us. When Elmira Approach descended us to 6,000', I was not surprised. Even though this broke the hemispheric altitude rule, it was clearly done to move us out of the way of the overtaking traffic. But the joke was on Approach. Our descent to 1,000' feet lower placed so much less wind on our nose that we picked up nearly 13 knots across the ground, nearly matching the ground speed of the other aircraft at 7,000'. For the next several miles, we watched the avatar of the other ship track roughly five miles behind Warrior 481 on ForeFlight. "Warrior 481, traffic, six o' clock and five miles, Bonanza at 7,000, also inbound to Sodus. He's slightly faster than you." Indeed, the other airplane was gradually overtaking us and Elmira Approach had finally decided to come clean about its presence. When both of us were handed off to Rochester Approach, I recognized the voice of the other pilot. It was Steve, current president of the Williamson Flying Club and our next door neighbor at the airport. As Steve and his wife slowly passed us, The Bear and I saw their Bonanza silhouetted against a spectacular developing sunset. I pointed the sunset out to The Bear, who immediately started snapping photos with her camera. Abruptly, her camera shut itself off. "Low battery," The Bear explained, glowering with frustration over her foiled attempt at photographing the sunset. Her angry face slowly dissolved back to neutrality as she returned to her book. "Hey, make that face again," I asked her, powering up my camera. She did and it looked like this. I showed her the picture and we both laughed our heads off as the Warrior slipped smoothly through the glowing sky toward home. Our laughter was punctuated by Steve's radio calls in the pattern at Williamson-Sodus as the sunset developed into its full glory. "Cool" I heard The Bear remark as we rolled onto final approach for home. Despite the weak battery, she managed to get one last shot out of her camera that night and it was a great one. Outside our hangar, we compared notes with Steve before putting the airplane to bed. It was nearly 8:00, The Bear's bed time. Despite the fact that we had not eaten since DeNunzio's, we had eaten so well that we were only just starting to get hungry. She begged me to take her to Chipotle on the way home. How could I refuse? "Can we listen to Star Wars?" she asked as we left the airport. With Siri's help, we were soon listening to The Empire Strikes Back soundtrack. During "The Asteroid Field", I noticed that she was humming along. I always liked that piece and it was one that I was fortunate to hear John Williams conduct live in Boston earlier this year. She might vacillate about her interest in flying, but she is most definitely my kid. A happy Bear at Chiptole. We ended our long day happy and tired, The Bear enthusing about the great things we saw. The day was much more than just 5.9 hours logged as a pilot, but a full day of great memories logged as a father.